It’s the final week of Advent, and we’re into the O Antiphons during Vespers, which means Christmas is nearly here! It’s very exciting, and this year I have managed to keep Advent pretty well. We held off on Christmas music until last Saturday morning, we only had Jesse Tree ornaments on our tree until last Sunday, and I only just finished decorating our home Tuesday afternoon. We’ve prayed Lauds each morning before we started school for the day. When the girls were younger, I didn’t keep Advent this way. My tree went up the day after Thanksgiving, the Christmas carols started the same afternoon, and it was Christmas, Christmas, CHRISTMAS!! until the new year. We didn’t really think much of it back then. My faith wasn’t what it is today, and Nathan wasn’t even Catholic yet. Hello, Santa! Come on in! One other thing we’d always do was that we would visit Santa, and talk about when he would come to visit us on Christmas Eve. Even back then, Santa didn’t just bring you whatever you wanted, and the reason he brought gifts at all was to celebrate the birth of the Savior. Christmas was most definitely about Jesus first. Santa was like a side dish to the main course of our Newborn King. We would track Santa with NORAD, hang our stockings up for him to fill with little presents, and I’d use a different handwriting to put “Love, Santa” on gifts from him. Because Santa wasn’t some magical wish-granter who brought all of your heart’s desires, we were able to make a transition ten years ago when we moved to Virginia from Florida. Money was extra-tight, and we told the girls that Santa had contacted us to talk about Christmas presents. Too many children were forgetting that Jesus was the reason for Christmas, not Santa, and he was asking parents if he could please start bringing only three gifts (plus stocking goodies) for Christmas. This would symbolize the Wise Men; if Jesus was happy with 3 gifts, certainly children could be, too! So Mommy and Daddy still gave presents (often clothing and necessities), and Santa brought 3 fun gifts. I have friends who haven’t ever “done” the Santa thing. They’ve always focused on Jesus instead, and they often held a celebration on Saint Nicholas Day. They also celebrated Saint Lucy Day, plus patron saints of each family member. They asked their children to be kind about not telling other children what they knew about Santa Claus. But one thing they never did was shame other parents who did play Santa for their children. Yes, I said shame. The articles I’ve been seeing this year do far more than make a case for not doing Santa with your family. Many of them are venturing into reprimands and scolding. Instead of explaining why their families don’t have Santa and leaving it at that, they are written in a way that makes most parents who read it feel pretty crappy about it if they do play Santa. My kids haven’t believed in Santa in years, and they make me feel like crap. Leaving to one side the issue of mental reservation and the, ‘if-a-Nazi-was-at-your-door’ dilemmas, it seems obvious to me that telling a child—who does not yet have the cognitive ability to discern the truth of the matter, and who trusts you to tell him the truth about the world, (and at the very least, not to deceive him about it)—that Santa exists; that he ‘knows if you’ve been bad or good,’ that he can be tracked on ReindeerCam, etc. etc. is a lie: a falsehood told with the intent of deceiving. For this reason we don’t lie to our children about Father Christmas. The stories commonly told today about Santa Claus are based on legends surrounding the life of a real person. 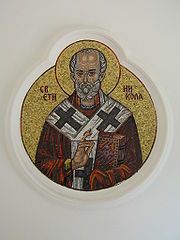 St. Nicholas of Myra was a fourth-century Catholic bishop in Turkey. He participated in the First Council of Nicaea—where he was famously purported to have slugged the heretic Arius for denying Christ’s divinity—and has been considered a patron of children for his generosity to them during his lifetime. For example, he is said to have provided dowries for three girls who would have been sold into slavery if they could not make good marriages. 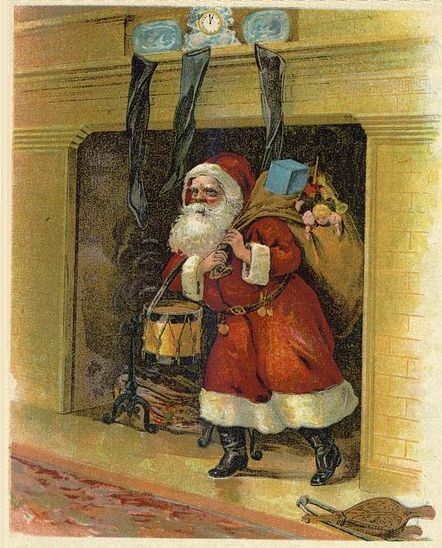 Over the centuries, the legends of St. Nicholas’s life have been supplemented with Northern European myths, eventually culminating in the children’s story A Visit from St. Nicholas by Clement C. Moore, which imagined St. Nicholas as a “right jolly old elf,” traveling the world on Christmas Eve in a sleigh pulled by reindeer, distributing gifts to children. So, what can children learn about their world through belief in Santa Claus? Children can also can learn from the Santa Claus legend that we are part of a larger universe, and that we are watched over and cared for by good spirits whom we cannot yet know empirically. This can be considered groundwork for introduction to the communion of saints. And, because Santa Claus is based on a real person, they need never stop believing in him; they need only mature in understanding of how St. Nicholas answers their requests. Does this mean that Catholic parents must allow their children to believe in Santa Claus? Of course not. If a parent does not feel comfortable taking this approach to Santa Claus (or the Easter Bunny, or the Tooth Fairy) the parent is free to leave out such stories from his child’s formation. I do think that Catholic parents should teach their children not to spoil the innocent fun of other children by telling those children that such characters are Not Real. Again, I don’t see Catholic Answers as an organization that would be looking to comfort parents into justifying sin, either. My answer isn’t a pat one, either. As I said before, my faith isn’t the same today as it was when we had our first child 15 years ago. If we were starting now, there’s a chance we might not “play Santa” the same way we did before, or at all for that matter. But it’s a decision each family has to make on their own, to the best their consciences can muster. It’s not a sin to believe in Santa or tell your children about him. But the judgmental posts to other parents are treading on dangerous territory, if you ask me. If your family doesn’t “play Santa,” that’s fine. But please don’t stand in judgement of my family or anyone else’s who does. Your condemning tone about it, whether or not you are open about it with them, is going to rub off on your children. It is the way our families have always done it. And I need — desperately, seriously, dying-man-in-the-desert-level need — one area of my life as a parent that I do not have to agonize about. As a modern mother, I am required to obsess over every. single. aspect. of my children’s lives. I have to make ALL THE CHOICES about ALL THE THINGS and I am EXHAUSTED. There was a time when mothers just did things the way their own mothers did, and that was that. There are plenty of downsides to that kind of cultural environment, but I’d imagine that one huge upside is that you don’t burn up half your mental energy questioning everything you do. Ultimately I’m glad that we live in an age where we’re all free to break from tradition and do things our own way. But I have to draw the line somewhere, and I’m drawing the line with our fairy traditions. I stand with Jen: We need to relax about things that are not inherently sinful, people. This is truly a Live and Let Live Option. Stop with the Santa Shaming! … There is at times a regrettable tendency among some American Catholics toward a kind of self-denial which is not actually based in the Christian asceticism of the Desert Fathers, but rather is a legacy of this country’s original Puritanism. It is why I have heard and read many times about Americans going to Catholic countries like Spain or Italy for the first time and being shocked by how Catholics in other countries behave. They see not only a more overt form of Christian devotional life than they are used to back in the States, but also a more widespread public celebration of religious holidays like Christmas, wherein religious elements coexist happily alongside material pleasures such as feasting, music, dancing, etc. I’ve experienced the opposite this year. At the Catholic school where I’m substitute-teaching, Elf on a Shelf is practically a curriculum item, and I’ve been “shamed” for refusing to take that creepy thing out of the box and think up something mischievous for him to do each day. I knew I’d had enough when the primary teachers were all complaining that kids were coming in, talking about how in their family, they did THIS custom with the Elf or Santa, and other kids had different customs, and they were worrying that the kids would get messed-up ideas in their heads because of this. My class made a handprint Advent wreath, Jesse tree ornaments (from your link to printables), a HUGE Advent calendar with fun and devotional ideas for each day, and each day we move the Holy Family a little closer to the empty stable. No one has been emotionally harmed for lack of Elf. They talk enough about what their home Elves do. 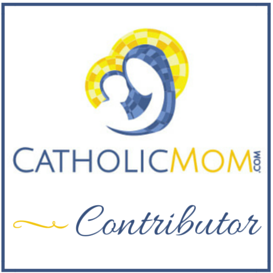 And, to me, THAT is a list of great ideas for Catholic families. I don’t think we need to be one or the other. We need a balance between the traditions of the culture and the Traditions of the Church. I think what really sent me over the edge was that the teachers were so put out that kids were talking about their own different family customs. Why not find a way to help the class reconcile the different customs, instead of shaming kids whose customs don’t match yours?